Oh, Phryne! I had such high (pun intended) hopes for you! I thoroughly enjoyed the Australian Broadcast Company's television series, and even though the first book in the series, Cocaine Blues, didn't live up to everything I loved about the show, I was willing to give it another shot. But with Flying Too High it all came crashing down around my ears. Unlike with Cocaine Blues, Flying Too High hasn't been turned into an episode for the television series, so I opened it with no preconceived notions of the plot at all. Phryne is called in to solve a couple of unrelated cases, one the murder of a brutal man and the other a kidnapping of the child of recent lottery winners. Nothing too out of the ordinary for a mystery series, though the logical leaps Phryne takes to solve the murder in particular stretched credulity a bit. In the book, Phryne solves crimes because she is bored. Period. There's really not any more noble motivation behind it than that, though she does like to make sure misogynists get their comeuppance. At least in the television series there's an intriguing back story that explains her determination to see murderers come to justice. 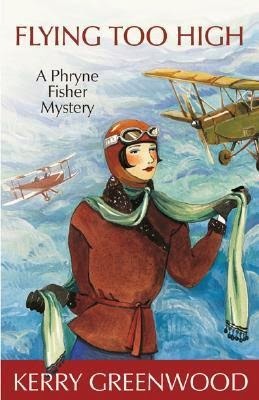 Phryne's a "modern girl" for the 1920s in that she flies planes like a daredevil, drives like a demon, attends lavish parties, and sleeps with whatever attractive man catches her fancy including, in this book, her client's fiancee, a huge ethical and professional breech of trust. I really like the Phryne Fisher portrayed in the television series. I really don't care for the Phryne Fisher portrayed in the books. And if you don't much like the main character there's not much draw to continuing to read the series.